A plantar fibroma or plantar Fibromatosis is one of the most common reasons for a lump to develop on the arch of the foot. These are often small (less than half an inch), but can grow steadily to reach sizes of 3 inches or more. They may occur as a single or multiple lesions, typically along the medial section of the plantar fascia. They are benign tumors that are composed of dense, fibrous tissue. Most patients with plantar fibromas do not have any symptoms and if they do, it is often only a vague discomfort from “walking on a lump”. These masses should be treated non-surgically with a soft accommodating prefabricated (over the counter) orthotic. However, if they grow larger or are a persistent source of discomfort, they may be removed surgically. Occasionally they will have a history of a similar mass in the palm (Dupytren’s Contracture). As the mass gets larger, they could report increasing discomfort with prolonged standing. X-rays are quite often negative but are usually taken to rule out other causes. An MRI will show a smooth, consistent (homogenous) mass that is associated with the plantar fascia. An MRI will confirm the diagnosis and allow differentiation of other causes of masses in the foot, such as lipomas, ganglions, neuromas, ruptures of the plantar fasica, and tumors (very rare). 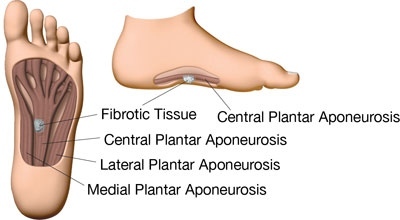 Plantar fibromas are typically treated non-surgically, unless they cause discomfort to the patient on a regular basis. Non-operative treatment includes anti-inflammatory medications, corticosteroid injections and soft accommodative orthotics. Surgical treatment should be avoided due to both the high recurrence rate and the difficulty with obtaining clear margins. This involves excising the mass and should only be performed if not responding to non-surgical treatment and the pain is no longer tolerable.